Let me tell you what drives me nuts about modern dance. It isn’t the dancing. I love the dancing. It isn’t even the fact most of it is movement for the sake of movement and being a writer, I’m always looking for the story. No, what really drives me nuts about modern dance is the music. I understand why most dance troupes select boring, repetitious music that may or may not be Philip Glass. I get it. I’m supposed to be watching the dancers. Personally, though, I prefer a soundtrack that sounds like more than a keyboardist who only knows three chords. I like the interaction of sight and sound. Most modern dance leaves me wanting more. And it isn’t the dancing. It is the fact my eyes are excited and my ears are bored. Here’s some notes on the shows I saw Wednesday! They were all quite good! Full disclosure – I dozed off during this show on a couple of occasions. I bring that up because it was by no means the fault of the show. It was because I usually burn the candle at no less than three ends during Fringe and it caught up to me at a bad time. Because I really liked the show. And I didn’t want to be dozing because I find phillip low one of the more gifted storytellers at the fringe festival. I also found the topic fascinating. I love his style. I love the way he really gets into his stories. He just seems so completely present. He guides the listener though some of the less well known stories in the life of Jesus. If he has his own spin, it is subtly woven between the lines, though the stories do seem to be told primarily in his voice. I walked out wanting to read his script. And peruse his sources. And ask him what he thought about what he was saying. So phillip – if you saw me dozing in the second row, I’m really sorry. I promise you, it wasn’t you. It was me. A friend recommended this show to us and that’s a good thing because I probably would have skipped it otherwise. The dance was an exhilarating combination of dance and acrobatics that, at times, bordered on the unbelievable. That bodies can do such things is a surprise. That they were done seemingly without physical effort was mind blowing. From the lead-in to my reviews, you may guess that I hated the music. And so I did. I wanted the intensity of the soundtrack to match the intensity of the dance. The soundtrack was, of course, not the point. The dancing itself should have been enough. And yes, the dancing was enough. Much more than enough. 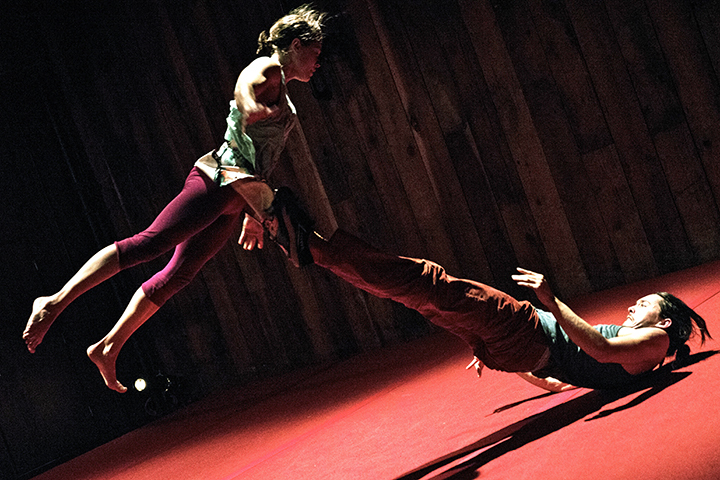 This is easily one of the best pure dance shows at this year’s Fringe. In case it has somehow escaped your attention as you read my reviews, I wrote this show. Our final performance is on Saturday at 7:00. Hope you make it! Tim Mooney loves Hamlet. All of it. If you weren’t aware of how much Hamlet there is, you should watch the uncut version by Kenneth Branagh at some point. There is a lot of Hamlet. So Mooney has kindly chopped the play down to an hour. He describes some scenes and delivers other monologues in full. At least part of his intent, I think, is to help the viewer understand the character of Hamlet within the context of the play. He does so at a…ahem…breakneck pace. He pauses to catch his breath only a few times as he delivers most of the speeches you remember and several that you don’t. It was a tireless performance by someone who truly loves the source material. Tim is one of the most accomplished solo performers at the Fringe. His shows are never disappointing. Hey there, Tim — just taking a moment to thank you for taking the time to put together some thoughts and post a review! No worries on the dozing thing — I’ve done it a handful of times myself over the years, during shows that I was enjoying. People underestimate how physically grueling the Fringe can be. Look forward to seeing you around!